I really loved this book when I read it last year--so why I didn't immediately review it is beyond me. Emmie's a likeable main character. What I liked about the story most was the sense of precariousness that I felt around Emmie. She trusts Deacon, but is under so much pressure to believe in his guilt. There's incredible tension around whether or not she will stick to her guns or if she's going to cave to everyone else's opinion. And because the reader sticks with Emmie, we're also left to question Deacon's innocence or guilt. I think that was a really good decision, not to include Deacon as a narrator. Because we'd seen things from his side, it would have been clear one way or the other from the get-go. Not knowing raises the stakes for the reader in a way that I really enjoyed. 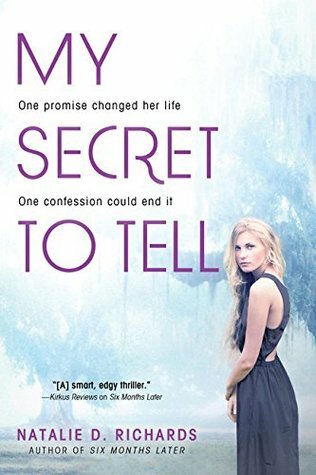 There are some great twists in the plot, and while I found one of the biggest ones to be pretty predictable, I still really enjoyed reading the book. I also loved the setting. Touristy, boat-oriented, it was a bit out of the ordinary from what I'd been reading at the time, and I liked how that played into the story. The dynamics of locals versus tourists and how locals interact with tourists (e.g., Deacon flirting with the tourists for the sake of sales) was really interesting to consider. I'd call this one YA romantic-suspense, even though it was romance-lite. I would have loved a bit more on the romance front--the draw between Emmie and Deacon provides a significant emotional connection point for the reader. More payoff on that front would have been nice. I realize the conditions aren't really conducive, and this is a YA book, but... still. Still, I was entertained by this book, and ultimately, that's what I ask for in my fiction. My Secret to Tell is a pretty entertaining read for an afternoon when the kids are at school, and you want unwind from a productive morning. Pick it up, and enjoy! For fans of YA fans, particularly if you like mystery/suspense in your stories.